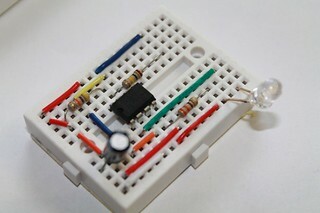 Description: Astable mode of 555 timer is used to generate pulses at regular interval. READ ABOUT ASTABLE MODE. The following schematic has been taken from buildcircuit.com. 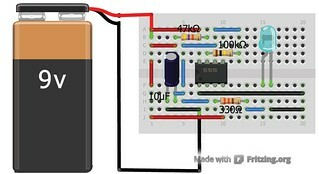 The following circuit can work as a music generator, Infrared transmitter and LED blinker depending upon the values of R1, R2 and C1. Download FREE simulators for learning 555 timer. In this post, we are showing how the values of R1, R2 and C2 make changes in output of the circuit. In this project, R1= 47k, R2=100k and C1= 10uF. When you power the circuit, the LED blinks at a regular interval as determined by the values of R1, R2 and C1. Making a minor modification in the previous circuit makes it work as an infrared transmitter. We can use this infrared transmitter for testing IR sensor circuit and making an infrared based object counter. Again, a simple modification would make it work as a sound generator. 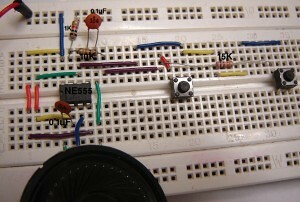 CLICK FOR THE ORIGINAL SOUND GENERATOR CIRCUIT. When you block light falling on the LDR, the pitch of the sound changes. 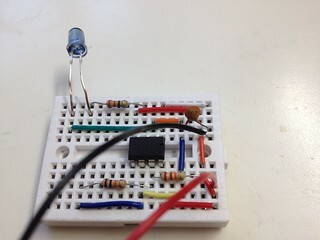 You can use this circuit for making a music toy organ. 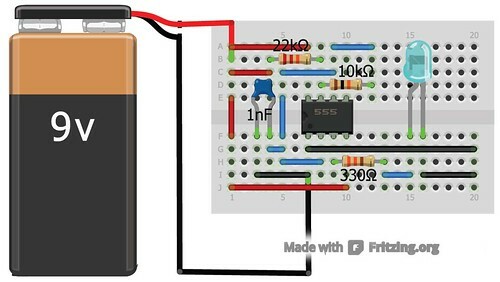 You can modify the circuit in the following way. Simply remove the LDR and add series of switches and resistors to make a simple organ. Click here to read more about this project. PLEASE HELP ME! I assemble the circuit involving the ldr, but when in bright light, the noise just stops! please tell me how i can resolve this!